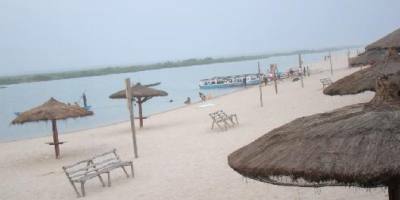 Bojo Beach, The Only "Island Beach"
no other beach in Ghana or the world can contest with. to have abundance of beach life and sneak away from the busy city of Accra. 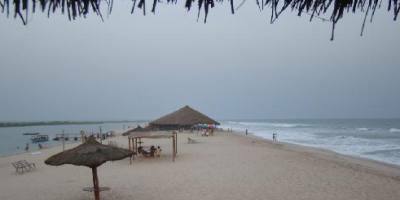 becoming a very poplar beach destination for many tourists in Ghana. This nice beach can be found on your way to Kokrobite Beach. Bojo Beach is the only beach where you experience the rich "Island" experience on a sand bank with one side being fresh water and the other side being salty. This beach is sandwich between a lagoon and the sea shores. The lagoon joins the sea at some distant point, thus making a long strip island. The fresh lagoon side is quiet and the beautiful sea side is very active with vigorous waves and splashes. It is amazing how this beach is very clean, quiet and romantic. 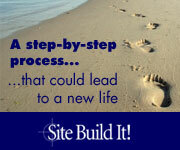 One interesting thing is that, when you arrive at the beach entrance you'll think you there rite? You're wrong. There are special small canoes and boats that carry people across from the land to the shores. These canoes are operated by trained and friendly staff so dont worry about your safety. For people who want to ignite their adrenaline and have more fun, ski jets are available to rent. It cost just a few bucks per ride or time. some continentals and all sorts of alcoholic drinks and soft drinks. You just can't complain about the music, very good to your soul and mind. The small huts scatted across the beach makes this paradise on earth a blissing and a relaxation joint after a hard week's work.